So a guy approached me about swapping my stock exhaust for his.... anyone ever heard or had a Tanabe SMR 2.5 catback on a 5th gen? I have only had Thermal R&D? Fill me in before I drive to see it. how old is the exhaust? any damage? I'd ditch my stock for aftermarket. check out some youtube clips of the tanabe exhaust on a prelude. Cool thanks. He has had it on his car about 6 months he wants to sell his car so he's going back stock I guess. 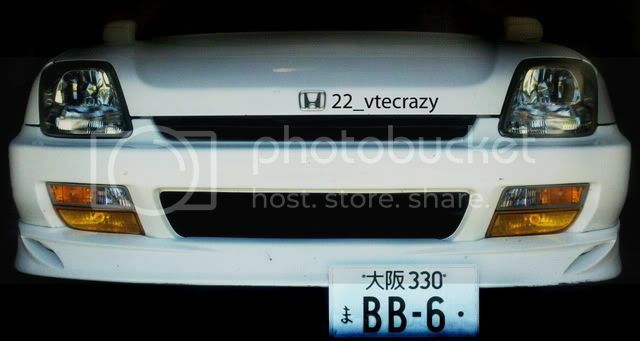 i had tanabe racing medallion on my old si an loved it. it was a bit loud, but i run 3" and a vibrant muffler on my new setup which is a tad louder soooooooooooooooo, cant really complain about the racing medallion. which is what that exhaust almost looks like. Really. I'm so used to my Thermal that this looks way big and sounds loud. I mean maybe I should just go listent o this guys car. He wants to straight trade so no going back. I want low burly but quite ya know. This would offically be the first mod too. LOL. Sounds like a Great Deal, but you gotta check for rust, dents/dings, etc,etc. Is his car dropped? Did he let you hear it on his car? Oem swaps for after market are always suspect. I'd jump at it if everything is fine. Also they are a tad bit raspy (as are most honda aftermarket mufflers) you can also supplement the deep tone with an 18 or 12" resonator to help suffocate the raspiness. It'll help give it more of a grumble than a "Zing" sound. I'd LOVE a dual tip Thermal on my car or a dual exhaust but I mean for a straight trade if it's not bad it's worth it. I surely can understand that.A car with an aftermarket exhaust might give the perspective buyer the idea that the car may have been modded and the average person, including some of those people who themselves mod cars, (lol) will tend to avoid such a potential problem car.If you want a more aggressive sound from your car , just save your self a lot of trouble and mealy plug the tube that goes to the resonator on your stock intake plumbing.Boosting the sound of your intake will give you a loud aggressive roar from your engine compartment due to the high rpm valve over lap from your VTEC engine and keeping your common 4cyl exhaust noise down and letting your intake do the talking is how to get the best overall sound emulating from your VTEC powered car in my opinion. i have a tanabe on my 4gen and i love it. its something that not alot of ppl have. its a nice change from your usual dc, greddy, etc. Let us know how it sounds first hand. Ya tanabe's have that weird look... I'd still with the Thermal exhaust. Well I am meeting up with him tonight. So I will let ya know. You better be careful . I have seen some people where I live install mufflers like that to close to the the bumper and end up melting it. Mine also looked goofy from the side but that will also change if you have a rear lip...Because I have a Janspeed Exhaust and it looks like it would be a "rice" exhaust but it sounds perfect...couldn't have asked for anything better! haha but ya let us know how it goes! vibrant FTW!!! id post a video, but dont wanna threadjack. Upon second glance, I'd skip it. If you need a resonator to keep it quiet, not worth it. Melting bumpers? Useful post. Really. ILL LET YOU GUYS KNOW WHAT I THINK. GOING IN A FEW HOURS TO SEE IT. Vibrant is the muffler, cat and resonators that im running. Lol!!! You might find some cf hoods on ebay or check your local craigslist. Siebon makes a reeally good quality hood but they run about 5-6 bills. Also, check all the for sale threads on all the prelude forums. I think there is a hood and trunk on here for sale. hahaha thanks!! So i saw the exhaust... not bad. I said ok ill trade ya... then Im like ooooh and the aem intake ill throw in cash... He replies ok well if we swap exhaust i want a bill. Meh Im good, you wanted to trade not me lol. Plus will a 98 non SH exhaust bolt the SH?? Looks a bit diff under there. So I'll stay stock I can throw a billinto something better. Yeah NO go oh well.